Leia Birch Biggs has always been a fangirl. A graphic artist who draws for big names such as Dark Horse and DC Comics, she is also known within the comic book world for her own work, Violence in Violet, which ends with a planet-wide apocalypse. After speaking at the Atlanta ComicCon and having all in all a rotten day, she’s vulnerable to the advances of Batman–that is, someone cos-playing as Batman. Now she’s pregnant at 38, determined to keep her son and just as determined to be in charge of how her family and friends find out. Her family is, after all, a fairly conventional Southern family, and she’s about to become a single mother to a biracial baby. Leia has a complicated relationship with her step-sister Rachel. Rachel has always been perfect, and she shows her love and concern for Leia by meddling in her life, organizing what Leia does not want organized, and generally driving her crazy. But as Leia shows up, with a pecan cake, to break the news at a family luncheon, she finds Rachel’s perfect marriage (to the boy who was Leia’s best friend in high school) imploding around them. On top of this, since never did family crises arrive singly, she finds out that same day that her beloved grandmother Birchie has been hiding a medical diagnosis, a form of dementia called lewy bodies. At her small town church’s annual fish fry, this proper elderly woman bursts out with the most inappropriate story, leaving the entire town aghast, and Leia’s cell buzzing like an agitated wasp. Leia takes Rachel’s daughter in tow and heads down to find out what’s going on, only to find her grandmother and her best friend from girlhood, an African-American woman named Wattie, have dug in their heels and are refusing to budge. As things progress from bad to worst, Leia and the town stumble across a secret with deep roots, stretching back through generations, a secret that threatens to upend the entire town and change lives forever. I have to admit that I’m somewhat of a fangirl of Joshilyn Jackson. I love her characters, her sense of humor, and the worlds she creates. She gives us people that are as flawed and broken as we are ourselves, yet her books give a sense of hope and redemption. The Almost Sisters might be her best book yet (although I really loved her last 3 books too, so it might be too hard to pick). She presents to us her beloved South in all its grandeur and all its sorrow too, its good and evil parts coexisting. She takes an uncompromising look at issues such as identity, family, fatherhood, integrity, race, history, and privilege, yet she keeps everything grounded in some very relatable characters whom you’ll grow to love. I rarely give books a 5 star rating, but this one deserves it. Highly recommended! 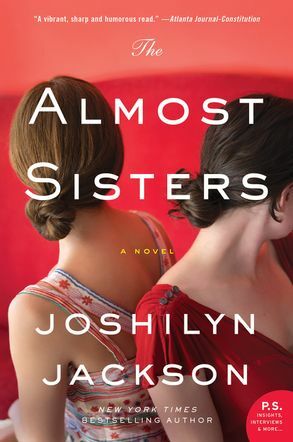 I just reviewed The Almost Sisters too and adored it! I’m eager to start another one of Jackson’s novels – any suggestions for which I should read next? I would start with “Someone Else’s Love Story.” I loved that one. And Jackson has a habit of writing a second book about one of the peripheral characters in the first, not a sequel but a sort of parallel. She did that with “The Opposite of Everyone.” So read “Someone Else’s love Story” and then “The Opposite of Everyone.” Let me know what you think!